That's the case with Drop.io and MyBloop, the two latest sites ready for you to back up and share files. Drop.io (it reminds me of the "Old McDonald Had a Farm e i ee i o" song) is a handy spot to stick a file for friends to download. It's a snap to use because there's no registration required and no need to create an account. Give the Drop.io file a name, upload it, and send an e-mail link to your buddy (or use it as a private RSS feed). Drop.io has extra doodads, enough so that I'm using it like crazy. For instance, you get a number to call so I can leave a voice blurb with the file. You can fax docs into a Drop, keep the file private or make the file available to a select group of friends, allow comments, and set an expiration date (or not). Play around with Drop.io and let me know what you've done with it. MyBloop leans towards a way to give you a spot to upload and store files an unlimited number of files (up to one gigabyte each); it's also easy enough to share the files with others. About the only restriction is that you're unable to let others download music files. Instead MyBloop gives your buddies a way to stream your tunes. Quick tip: You voted (okay, maybe not you), now see the results in "The Best Products: Readers' Favorites." Everyone needs to remove a USB device every so often; too bad the Safely Remove Hardware applet sitting in the System tray is so slow. I've been playing with the USB Disk Ejector, a nifty little freebie that lets you quickly remove USB devices--scanners, flash drives, external hard drives, whatever--by either the drive letter or name, or from the name of the program the USB device is using. While you're here, take a look at "You Can't Beat USB." There's no doubt, though, you'll need decent bandwidth--WWT pulls just about everything from the Internet. And a big monitor will certainly enhance the experience. On my wife's 19-inch LCD everything looked good; on my 24-inch widescreen, it was breathtaking. 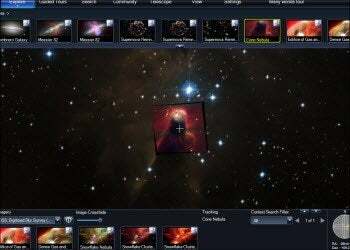 Once you have the WorldWide Telescope downloaded and installed, click the Guided Tours tab. It's a good spot to get a sense of the program's capabilities. 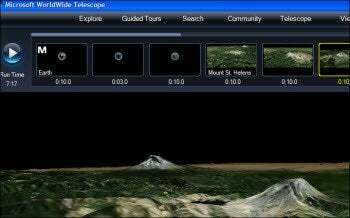 You'll find 11 categories--Black Holes, Star Clusters, Planets, Supernova, Learning WWT, and others--and each has a handful of slide show tours created by experts. Take a look: Apple's ads are usually sharp and funny, but some of the parodies of those ads are even better. See "The 10 Funniest Apple-Ad Parodies." If you paid attention to the file sharing stuff above, your productivity level is high enough for you to spend some time with these decidedly unproductive time wasters. This seven-minute video by Blu mixes street art animation and video-still photography into a fascinating blend. Do you like mindless games, things that take a couple of minutes to figure out? I have plenty: a dozen mental tests, almost 30 weird puzzles and memory teasers, and another 30 strategy games. They're all free on Mind Bluff, and they're perfect for those endless teleconferences. I watch Dirty Jobs, a Discovery Channel phenomenon. Mike Rowe, the host, is a charmer, with a snide, off-the-wall attitude. He delights in getting a chance to operate heavy machinery (yeah, it's a guy thing; live with it). You, too, can grab the controls of a backhoe and a big, beefy bulldozer, and haul rocks and dirt hither and fro. It'll cost you, though, because to get to Dig This you'll need to travel to Steamboat Springs, Colorado and pay $350 for a half-day or $650 for a full day of guilty pleasure. For that money, I'll bet they lend you a hard hat and a pair of steel-tipped boots.